Yesterday Sarah Palin sat down with Barbara Walters to do an interview that will be aired next week over the course of a few days. ABC reports it will begin with “Good Morning America,” “World News,” and “Nightline” on Tuesday. The interview can be seen in its entirety on “20/20” Friday at 10 p.m. EST. Thanks to C4P, I have a Youtube video to share with you promoting the interview. 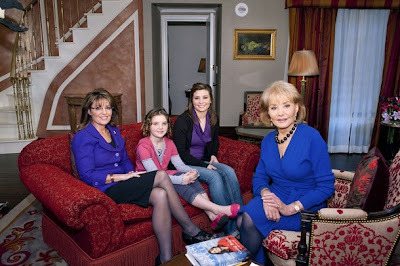 Team Sarah member, Karen in Michigan, directed me to Oprah’s promo of Monday’s interview with Governor Palin. I hadn’t seen it. Thanks, Karen.